Triloki N. Pandey, a professor of anthropology at UC Santa Cruz, has been awarded the Mahatma Gandhi Pravasi Medal by the NRI Welfare Society of India. Pandey, who will receive the award Friday, October 12, 2012 at the House of Lords in London, is one of only 30 Indians worldwide to receive the honor. The Gandhi Pravasi medal is given to recognize outstanding services and achievements by Indians in the international arena. The NRI Welfare Society, based in New Dehli, was founded with the objective of strengthening the emotional bonds between non-resident Indians and India. In September, Pandey delivered the Justice S. Rangarajan Memorial Lecture at the Indian Institute of World Culture in Bangalore, India. 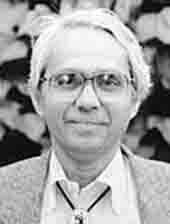 Pandey joined the UCSC faculty in 1973. His research centers on tribal cultures in India, Nepal, and the American Southwest. He has done fieldwork among the Zuni, Hopi, and the Navajo of the American southwest, and more recently among the Tharus of India and Nepal, and among the Khasi, Garo, and Naga of the northeastern India.